It would be hard to find a more picturesque spot for a family farm than the one inhabited by the Dungeness Valley Creamery. 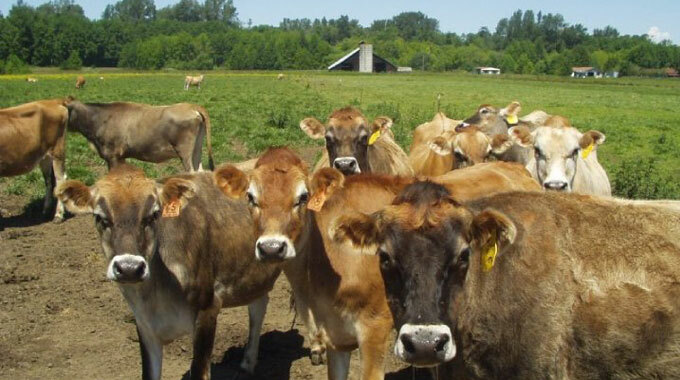 Located on the Dungeness River one mile from the historic community of Dungeness on the Olympic Peninsula, the farm is home to a herd of 60 milking Jersey cows, a new creamery, and a family home, all on 38 acres of lush pastureland. Overseeing this idyllic setting are two Peninsula College alumni, Sarah and Ryan McCarthey. Together, they are using the skills they learned as students at PC to help them run the farm they now co-own. “Sarah’s lifelong dream was to stay involved with the family farm,” says Ryan, and in March 2012 that dream came true when the two took over the Dungeness Valley Creamery from Sarah’s parents and became second-generation dairy farmers. Together, the two produce, bottle, and distribute about 300 gallons of whole raw milk each day. In addition to all of this, Sarah and Ryan are also the proud parents of a very active toddler, their almost 2-year-old son, Tyler, and are expecting baby #2 in March 2014. Both Sarah and Ryan are very positive about their Peninsula College experiences and credit them with helping them to get where they are now. Sarah earned her AA degree as a Running Start student and then transferred to Washington State University (WSU) for a BS in Animal Science. Ryan earned his Bachelor's of Applied Management degree at Peninsula College after receiving an AA at Olympic College. Sarah chose to enroll in Peninsula College’s Running Start program because it gave her the chance to earn a college and high school degree at the same time and get a head start on her degree at WSU. But it was also important to Sarah to remain involved with her high school peers who were not in Running Start, and she tried to stay connected through tennis, the honor society, choir and FFA. Having a flexible schedule also helped―taking three classes a day gave her time freedom, and she was able to take elective classes at the high school and stay involved with her friends. Sarah also was pleased that the quarter system allowed her to finish more classes in a year than she would have on the semester system. Once she had graduated, Sarah went on to WSU but chose to come back to Peninsula College during the summer between her junior and senior year to take chemistry and statistics. She knew she would have more personal attention and access to the teachers at PC, which was a big plus for her after experiencing the larger, more impersonal classes at the university. Ryan earned his Bachelor's of Applied Management from Peninsula College in 2011. “After Sarah and I were married,” he says, “I was deployed to Iraq with the Army Reserves. Sarah’s lifelong dream was to stay involved with the family farm. I was researching schools online where I could finish a four-year degree using my GI Bill when I found out about the Bachelor's of Applied Management program at Peninsula College. With Sarah having a degree in Animal Science from WSU, and my interest in the business side of the farm, the Applied Management program seemed like a great fit. “At first I was attracted to the idea of the school being local, but I enjoyed the smaller class sizes as well,” Ryan adds. “Students tend to work in small groups regularly so we got to know each other very well, and my classmates became like a second family. “While Sarah and I had a specific career and business in mind for our future, I feel Peninsula College helped me blend my passion with a broader understanding of business and helped equip me with tools to handle nonfarming aspects of running the farm, such as accounting, financial analysis, marketing and legal issues,” Ryan adds. “I had a great experience earning my degree at PC. I felt the Bachelor's of Applied Management program was the quality you would expect at a larger university, but offered right here at home,” Ryan says. For these two young entrepreneurs, Peninsula College was a great choice―it helped them realize their dreams and it can help you do so, too! Learn more about Running Start and the Bachelor's of Applied Management programs. 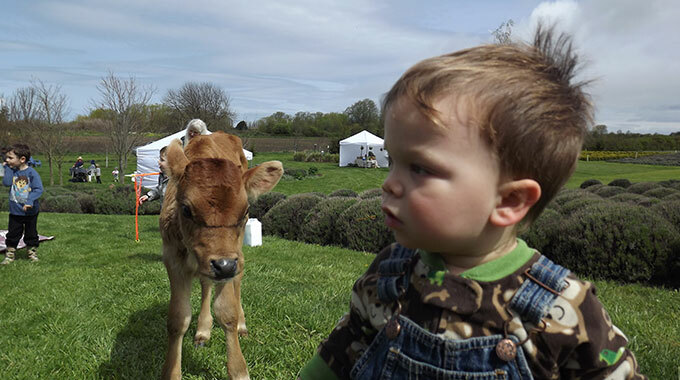 A young Tyler and a young calf get acquainted.